Thank you. You just made my weekend. I made this pic my laptop backgound second after you posted it in tumblr XD I think this one is slightly higher resolution. Thank you for posting all this it's amazing. Oh my God, I don't even wanna guess what the elf-lady is talkin' about.. I love their all their faces - Cassabdra looks so disapproving! And I love your blog and I'm just foaming at the mouth at all the DA and ME and everything! Hey, I noticed something about the eyes in this and the previous drawing, and i know you can't reveal anything about the game, but is this just a personal stylistic choice to get the message across about the person being a bloodmage? Or is this new cannon? Because I think it's brilliant to make blood magic a more subtle transformation rather than an instantaneous one that just makes you explode into a monster randomly. The eyes might be part of the elf redesign. This lady is clearly an archer, not a mage. She has a three-finger glove on her draw arm and an archery bracer on the other. Thank you Matt, great atmosphere and visual storytelling. The Mage in the previous piece cleary isn't an Elf, Smarty Pants ;] That's why I thought blood mage, but now that I'm looking she doesn't really look like a mage. Maybe it is just the lighting. Matt, Jacob Lauser here. You did a piece for me in some years ago. I just got back from Illuxon in Allentown, PA, and I was wondering what ever became of you. Do you do any oils? Looking to commission a new piece and thought I'd see what the scoop was. E-mail me please. 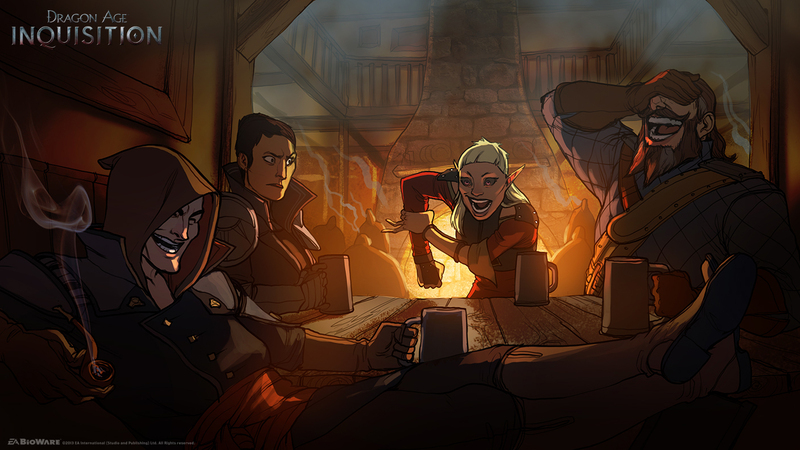 This one perfectly represents that unique aspect of Dragon Age: companionship, warmth and togetherness. Dude your drawings are awesome, I liked My Hero, where can I find complete comics that you have made?